The region's social movements are a useful model for US leftists wanting to influence Obama. JAMIL BITTAR/REUTERS Brazil’s Landless Workers Movement protests President Lula da Silva’s agricultural policies in Brasilia in 2007. Rain poured down in La Paz, Bolivia, the day Barack Obama gave his inauguration speech. But the weather didn’t stop thousands of Bolivians from marching in the streets in support of a new constitution, a document set to grant unprecedented rights to the country’s indigenous majority. As chants and the explosions of Roman candles from marchers echoed throughout this capital city, Obama looked out from the television screen in a La Paz bar, offering words of wisdom that were somehow connected to many Bolivians’ sense that democracy and good politics depended on a mobilized public taking to the streets. Similarly, it has been the “faith and determination” of Bolivian social movements in their fight for a better world that paved the way to the election of indigenous President Evo Morales, and then pushed him to nationalize gas reserves, redistribute land to poor farmers and enshrine long-overdue rights in a rewritten constitution. The juxtaposition of Obama’s orderly inauguration and the near-constant street mobilizations in La Paz brings us to the question: what can US activists facing economic crisis and a potential ally in the White House learn from South America’s social movements? The region’s shift to the left–from leaders in Venezuela, Bolivia and Ecuador to the more moderate presidents in Brazil, Chile and Argentina–has grabbed headlines in recent years. But often overlooked is the role social movements and unions have played in ushering these leaders into power, and once they are there, radicalizing their politics. Other movements throughout the region never waited for allies in the government palace, and instead built their new worlds out of the neoliberal wreckage of the old. As unemployment skyrockets in the United States, and the challenges of cleaning up the mess of the Bush years commences, US activists could apply the successful strategies of South American social movements. Ida Peñarada, a Bolivian water-rights activist living in Cochabamba, understands the hopes and horizons of social movements. She participated in Cochabamba’s 2000 Water War, a popular uprising that kicked out Bechtel, a multinational company that had privatized the water in everything from communally built wells to rain cisterns. Many citizens from across the economic spectrum couldn’t afford the exorbitant rates set by the company, so they joined together in protests and road blockades, sending Bechtel packing and putting the water back into public hands. The challenge for many Bolivian activists in the Water War, as well as other social movements leading up to the election of Morales, was, as many movement leaders explained to me, moving from a position of “protests to proposals.” This isn’t to say that movements in the United States should subordinate themselves to the Obama administration. On the contrary, radicalizing Obama’s politics should go hand in hand with building alternatives locally, outside the reach of the federal government. 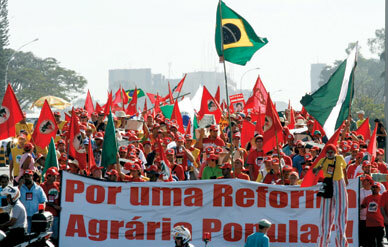 Such has been the case with Brazil’s Landless Workers Movement (MST). This movement, operating in a country with one of the most unequal distributions of land in the world, is made up of landless farmers who occupy unused land and work it to survive. When President Luiz Inácio Lula da Silva failed to follow through on long-promised land reforms, the MST didn’t waver; the movement continued its land occupations. Over the course of the MST’s twenty-five years of work, it has expropriated some 35 million acres, land that is now occupied by roughly a million families. The settlements, which are cooperatively organized, are home to hundreds of MST-built schools, which have enabled tens of thousands of people to read and write. Tens of thousands of communal councils around Venezuela also make sure government funds are used efficiently and transparently. Each communal council is made up of dozens of families who develop local projects, such as road building and electricity and water services. The council identifies the need, then develops a project proposal for the government. The government in turn finances the project. Now is the time for activists in the United States to run with Obama’s rhetoric when he says, “We are the ones we’ve been waiting for. We are the change that we seek.” A movement put Obama in office. Now it’s time to make Obama follow the movement.